EVPA is a membership association made up of organisations interested in or practicing venture philanthropy and social investment across Europe. Established in 2004, the association aims to be the home as well as the highest-value catalytic network of European social investors, venture philanthropists and foundations committed to using venture philanthropy and social investment tools to target societal impact. The EVPA Research and Policy Centre is the hub for knowledge and thought leadership on venture philanthropy and social investment – in Europe and beyond. It provides information on VP issues and connects researchers both through workshops and by providing information on the EVPA website. The Centre also plays a key role in informing our members and key stakeholders about national and European policy initiatives of interest to VP/SI and voicing members’ and stakeholders’ concerns to policy makers. Find out about our activities and our policy work. 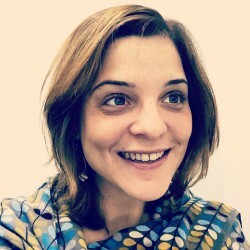 Priscilla Boiardi is Knowledge Centre Director at EVPA - European Venture Philantrophy Association. She joined the organisation in April 2014. Priscilla has more than 6 years of research experience, first as a Research Associate at the Vlerick Business School and then as a PhD candidate at the Catholic University of Leuven. She has strong expertise in research for business and public bodies, both qualitative and quantitative, and was responsible for the Global Competitiveness Report of the World Economic Forum for Belgium. During her years as a researcher, Priscilla had the opportunity to present her work to policy makers, fellow academics and practitioners. Priscilla holds a MSc (Hons) in Economics and Management of Public Administrations and International Institutions from the Bocconi University in Milan. She is an Italian national and speaks Italian, English and Spanish. "In my engagement I am really satisfied when... ... I see a good research project that is impactful and meaningful for practitioners and all relevant stakeholders. With ten years of practice behind us, venture philanthropy organisations are staring to build experience on a large number of topics, from how to generate impact, avoid mission drifts in the SPO finance, how to plan and execute an impactful exit. It is therefore essential to capture and spread knowledge and best practices about exits as early as possible, and make them available for all practitioners. EVPA research explores a multitude of aspects and options that VP/SI practitioners and SPOs face in their daily work. EVPA as a community aims at developing the knowledge in the field and capturing and spreading the experiences of the practitioner to maximise value for the field. Communities such as EVPA where knowledge is generated and spread are much needed, as they increase the effectiveness of VP/SI practitioners in Europe."